Help!!! We Need A New Club Show Site!!! 1. We need to be able to use the site for 3 days. Set up and 2 show days over a weekend. 3. The room(s) needs to have electrical outlets around the walls and even better if in the floor near the middle of the room. At least 20 amp circuits to handle our electrical needs. 4. Needs to have restrooms. 6. A kitchen would be nice but we can work around this. 7. Cost: This one is hard to figure. It will depend on the size and amenities of the facility. We can afford no more than a couple thousand dollars. 8. Dates: In the past, we have held our show over the last weekend of February. We all know and plan for this date however, we are amenable to different dates and can adapt if necessary. First though, we need to find a site. 9. If you should see or know of a possible site, please let the board know about it. We will be happy to check it out and see if it works for us. Are you thinking about going to Quartzsite in 2013? Some of our members are already planning an annual trip to this HUGE ROCK AND MINERAL SALE. If you have never been to Quartzite, you have missed one of the largest & most fun places for rockhounds. This year’s schedule is: MAIN EVENT: JAN 7-JAN 27; TYSON WELLS: JAN 18-JAN 27; RV TENT: JAN 19-JAN 27; POW WOW: JAN 23-JAN 27; DESERT GARDENS: JAN 1-FEB 28. The above is the major look and buy areas plus there are many, many smaller areas with many booths to shop for most anything you can think of. These areas are open most of the above times and many much longer. If you would like to camp with us, we will be at our campsite Jan. 22nd - Jan 29th. To find us, take the Quartzsite exit (2nd one) east of town, turn right to intersection. Then turn left at intersection that takes you on a side road which swings around parallel to Hwy 10 east. Go approx. 2 miles on this side road, over a small concrete bridge and turn right on the dirt road where there is signs for the Del Air Club. Signs will be white paper plates with “Del Air” and an arrow printed on them. Following these signs with arrows will take you to the campsite. Jim Van Winkle and his 14 year old grandson Everett Barton will tell us about their summer trip to Montana, traveling through 7 states. They spent one week with Paleontologist, Nate Murphy, from the Judith River Dinosaur Institute. Working with 12 other dig team members, they excavated bones for a long necked Camarasaurus and from a Stegosaurus at a lower level. Everett will talk about his experience and tell of the three Camarasaurus bones that he uncovered. Jim will tell about the sites they visited on the way up and back. The two of them brought back a large 50 pound piece of petrified wood from the Shirley Basin in Southern Wyoming. 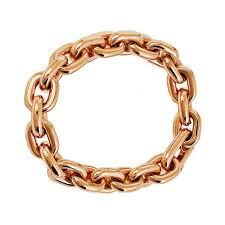 Gold is a dense, soft, shiny, malleable and ductile metal. It is a chemical element with the symbol Au and atomic number 79. Gold has a bright yellow color and luster traditionally considered attractive, which it maintains without oxidizing in air or water. The metal therefore occurs often in free elemental or native form, as nuggets or grains in rocks, in veins and in alluvial deposits. Gold has been a valuable and highly sought-after precious metal for coinage, jewelry, and other arts since long before the beginning of recorded history. 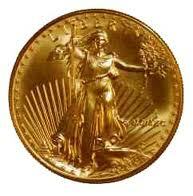 A total of 171,300 tons of gold have been mined in human history, according to the GFMS as of 2011. 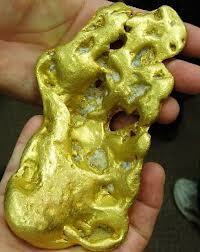 This is roughly equivalent to 5.5 billion troy ounces or, in terms of volume, a cube measuring 20.7 meters on a side. Besides its widespread monetary and symbolic functions, gold has many practical uses in dentistry, electronics, and other fields. Its high malleability, ductility, resistance to corrosion and most other chemical reactions plus conductivity of electricity led to many uses of gold, including electric wiring, colored-glass production and gold leafing. 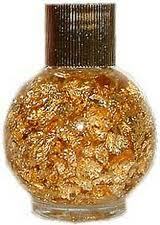 Most of the Earth's gold lies at its core, the metal's high density having made it sink there in the planet's youth. Virtually all of the gold that mankind has discovered is considered to have been deposited later by meteorites which contained the element. 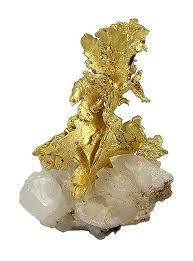 Native gold occurs as very small to microscopic particles embedded in rock, often together with quartz. These are called lode deposits. 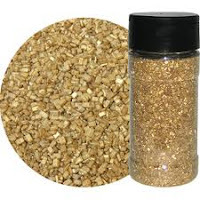 The metal in a native state is also found in the form of free flakes, grains or larger nuggets that have been eroded from rocks and end up in alluvial deposits called placer deposits. 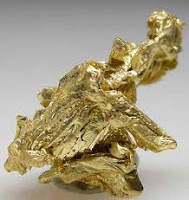 Such free gold is always richer at the surface of gold-bearing veins owing to the oxidation of accompanying minerals followed by weathering, and washing of the dust into streams and rivers, where it collects and can be welded by water action to form nuggets.